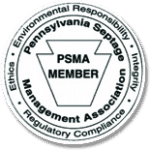 A septic tank is an essential part of every home in York, PA. The current septic system design is over 100 years old but over time changes have been made to incorporate changes that have made to make it even more effective and fitting if the times. Septic tanks could be as small as 900 gallons and as huge as 6,000 gallons depending on the size of the building and their use. Your typical family of four requires a 1,200-gallon tank to cater to all the waste waters being used in the home. Septic systems take in all the waste water used in the property and hold it until it is returned back to the soil. Usually, this water will mix regardless of its source and then it is separated while in the tank. Bacteria that live in the tank will break this waste down so that the heavier inorganic particles sink to the bottom and form what is called sludge, while the liquid part with organic particles floats to the top and forms what is called effluent. This liquid waste leaves the tank into the drain field, fertilizing the area around it in the process. A septic tank that is in great shape keeps the sludge at the bottom and effluent is let out as needed. If left un-pumped for long – typically over three years – the level of sludge goes above what is recommended and inorganic solids start finding their way to the top. They leave the tank and onto the drain field, blocking the absorption of liquid into the soil. This leads to a backed-up drainage system. You will know that your septic tank is not okay when bad odors come from them the drain field, grass around the area is too lush, and the level of nitrate in the water is higher than normal. For this reason, Smith’s recommends you have your septic tank pumped and cleaned at least once every two or three years. Why Choose Smith’s Sanitary Services? Trust us when we say installation and maintenance of septic tanks is a professional job that requires nothing but professionals. A poorly installed system is as bad as nit having one ion place and it will cost you twice as much to have it re-installed. Experts at Smith’s are not only fully trained to work on septic tank systems in York, PA, but they also undergo thorough continuous training to keep them in touch with new technology. There isn’t a septic tank system we can’t handle. You get all you need under one roof. We are experts in installation, repairs and maintenance, as well as pumping to ensure that your tank stays in good condition for a long time. Although septic systems last long and will not demand much in terms of maintenance, neglect can affect them real fast to leave you with the overflow of raw sewage. Smith’s will keep things in shape before that happens. Having been in business since 1959, we have formed relationships with residents of York, PA, and this sense of community keeps us in good relationships everywhere we go. Owing to our efficient services, we have repeat clients who have been with us since inception. Everyone who walks through our doors becomes part of that large family. Don’t wait until the drain field is backed-up to call Smith’s. Your septic system will only cost you a few hundred dollars to maintain and keep in good shape, but neglect will require a replacement that could set you back lots of money. Call Smith’s Sanitary Services today for all your septic tank needs in York, PA.